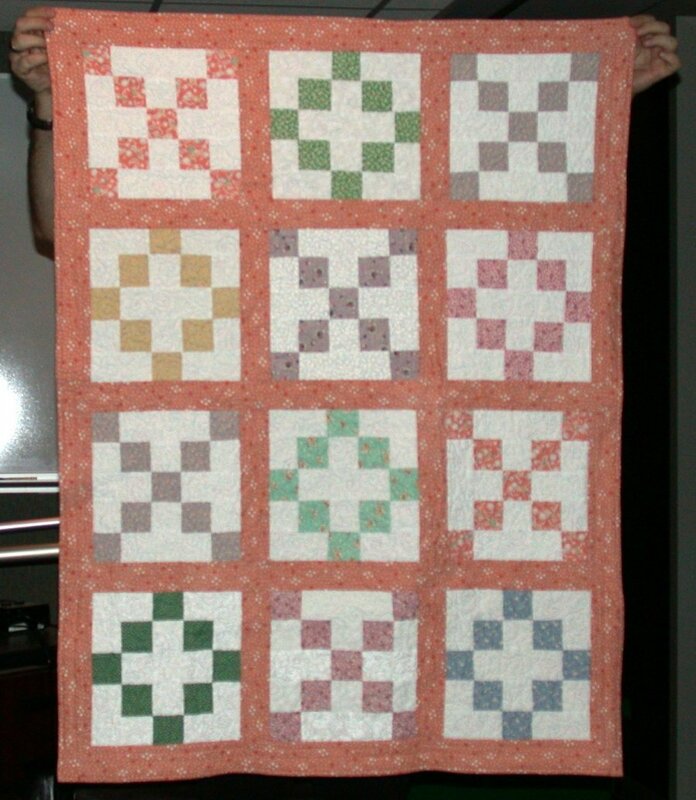 This quilt was actually one that I started in 2001, but only finished in 2005 for dear niece's high school graduation gift. I hand dyed the backing, shibori style. (See backing.) I quilted it in lots of little flowers. (See closeup of quilting) I even made a little flap that snaps up and covers the label. (See label). My thought was that she could use the quilt on both sides, and have a special hiding place too. She loved it quite a bit. I was happy to get it DONE! 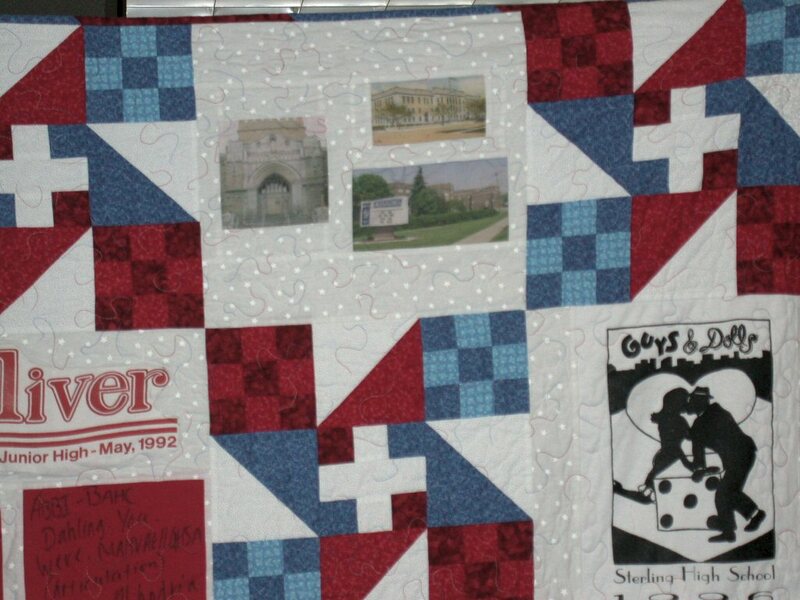 This quilt was made for dear great-niece Maya Segar (Vanessa's daughter.) 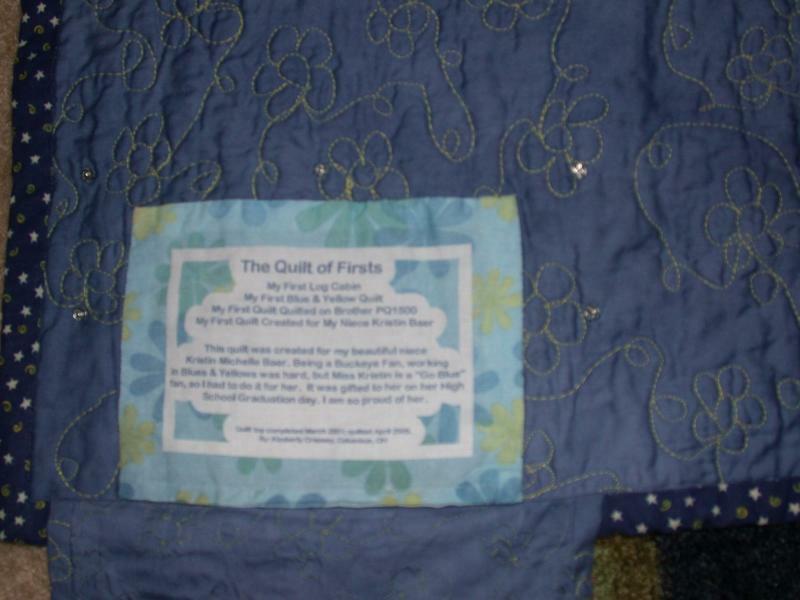 There was a lot of love put into this quilt! 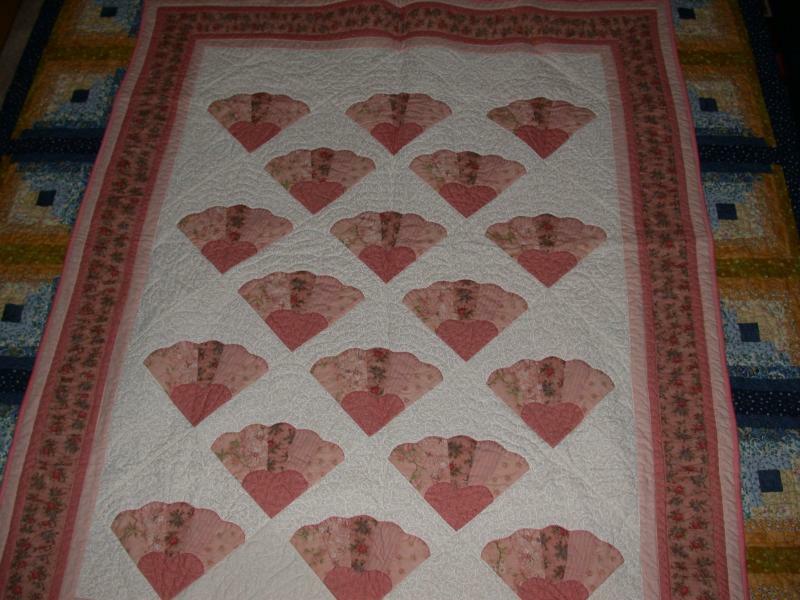 While I machine pieced the fan blades, the fan blade curves, and the corner circles were all hand appliqued on to the background squares. 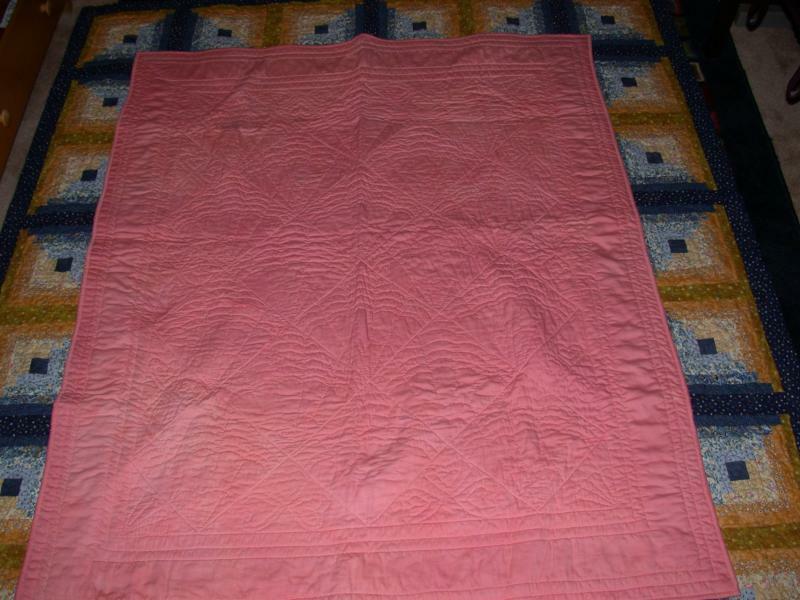 I machine quilted-in-the-ditch around each square, but all of the other quilting was done by hand. I spent I estimate over 100 hours on this one. 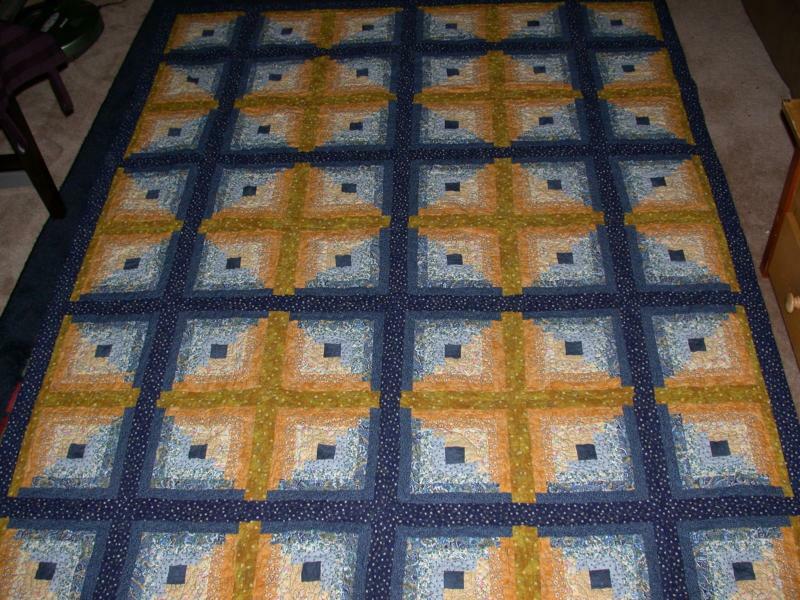 Of course, I am not much of a hand quilter, but this one just warranted it. 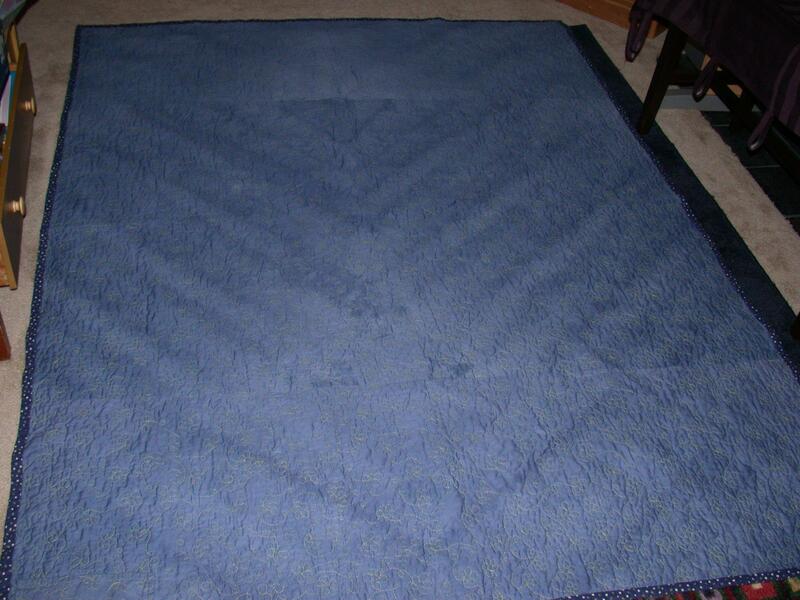 (See backing which was hand dyed on to a pretty Sateen fabric. 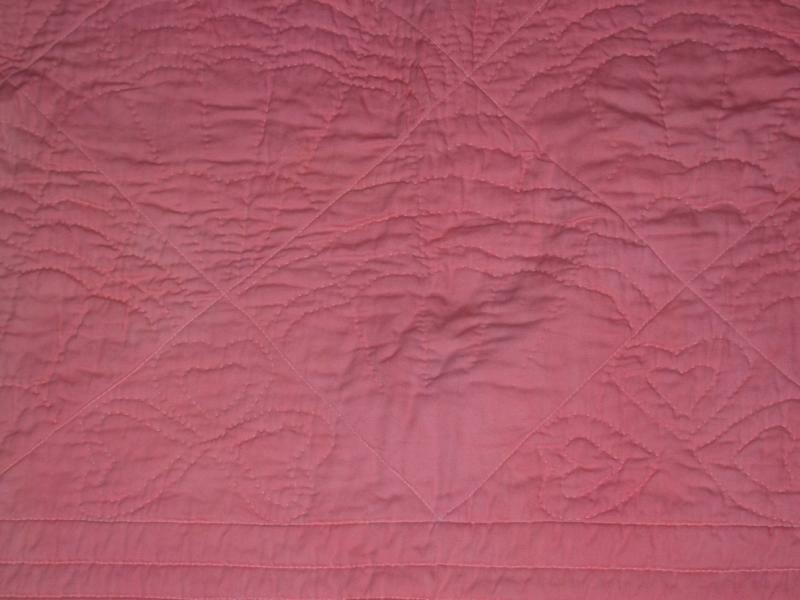 I used the same fabric for the binding, which was ok, but not quite the same shade as the other peachy-pinks in the quilt. You may also see quilting closeup and closeup of the fan applique. I was commissioned to do a t-shirt quilt by a lady at work. She was going to pay several hundred dollars to some website that was simply going to cut rectangles and add simple sashing. I couldn't allow her to do that so I did a total customized piece for her. 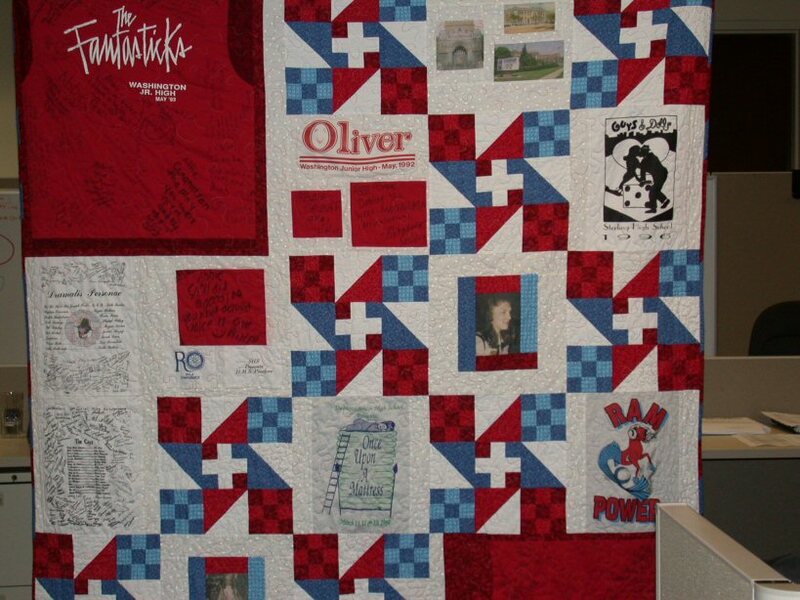 The thing that complicated this quilt is that she had t-shirts full of signatures. I wanted to try and save as many of those as I could, hence the funky looking applique. I literally had to applique sashing strips on some of the facings to make the square. I ended up not having enough t-shirt logos to make the size she wanted. So, I sneakily found out the names of her junior high school and high schools, well, the locations, and found the pictures of them on their respective websites. I then printed these out, along with several pictures from her own website, and added the "Comedy & Tragedy" masks to complete the theme. She was quite taken aback by it, and I swore I would never do another. They are not easy when customizing like this one. You can view closeup 1 and closeup 2. 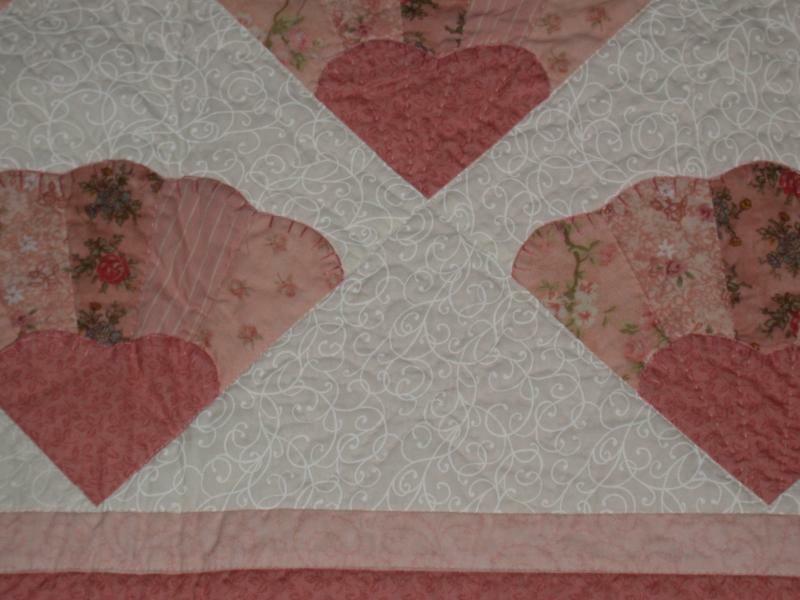 Here is my very own Hugs & Kisses pattern made with sashing. I had some leftover blocks, and another guy at work had a baby, so I made this up for him. He and his wife were the only people who ever invited me to parties after I moved to Atlanta. I never got to attend because of my crazy schedule then, but it was nice to be asked. So, I had to do something equally as sweet. I love it with the sashing too. All graphics and content ?2004,2005, 2006, 2007 QuiltPox.com & Kimberly Crapsey, unless otherwise noted. See full copyright notice.